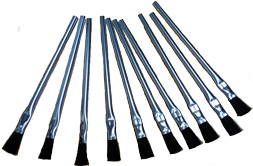 Our Rugged, Superb Brushes: Ideal for Thru-Hole Soldering & So Many Cleaning Applications! Applicator & Cleaning or Flux Brushes: Our popular THB Applicator Brushes are sturdily constructed for heavy-duty work. The handles are heavy grade tin-plated, 5-1/4 inches (13.33cm) long and stand up under most severe conditions. Horse-hair (non-synthetic) bristles extend 3/4” from the handle and are secured tightly by double clamping (Total Lg: 6" or 15.25cm) for maximum fiber retention. Ideal for Use with Most Chemicals! Our THB Brushes are used with most all flux removers and solvents, and also with most fluxes whether R, RA, RMA, No-Clean or Water Soluble. Essential for the Electronic Benchtop! Our THB Applicator Brushes excel in heavy-duty printed circuit board scrubbing and cleaning tasks common after soldering or de-soldering thru-hole devices like connectors, transformers, pin grid arrays, IC’s, resistors and capacitors. Our brushes clean those hard-to-get-to-corners and tight spots typical of today’s dense PCB assemblies. Caution: Never use brushes while working on live circuits. We enthusiastically recommend these durable THB Applicator Brushes for your through-hole and surface mount component PCB applications. ©1996 - 2011, 2012, 2013, 2014-2016, 2017, 2018, 2019 by Zephyrtronics®. All rights reserved. The information, text, images, photographs, charts, graphs you receive online from Zephyrtronics® are protected by the copyright laws of the United States. The copyright laws prohibit any copying, redistributing, retransmitting, or repurposing of any copyright-protected material. Zephyrtronics is the registered trademark property of JTI, Inc. "The Science of Zephyrtronics" and "Simplicity Through Innovation" and "Zephlux" and "ZeroLead" and "Zero Balling" and "Zero Residue" and "Post Cooling" and "Post Cooler" and "AirBath" and "SolderGlide" and "SolderMill" "ZeroTouch" and "Just So Superior" are the protected trademark property of JTI, Inc. "Zephyrtronics" and "Low Melt" and "Air Fountain" and "Fountainhead" are the registered trademark properties of JTI Inc. *The above names are the registered property of their respective owners.